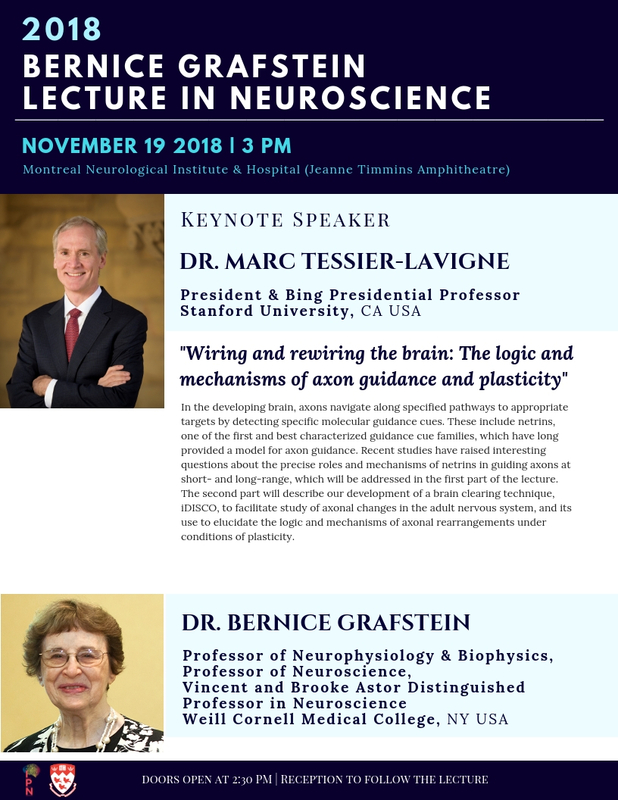 Organized by McGill University's Integrated Program in Neuroscience, the 2018 Bernice Grafstein Lecture in Neuroscience will feature keynote speaker Dr. Marc Tessier-Lavigne, President and Bing Presidential Professor at Stanford University (California, USA). The inspiration and motive of this lecture event is to honour and recognize Dr. Bernice Grafstein for her accomplishments in the field of neuroscience, and more importantly, for being the first woman to become President of Society for Neuroscience. This lecture event also aspires to encourage intellectual collaboration amongst its attendees coming from all over the province. Dr. Marc Tessier-Lavigne will be delivering a keynote address titled "Wiring and rewiring the brain: The logic and mechanisms of axon guidance and plasticity." Abstract found down below. Pioneering neuroscientist Marc Tessier-Lavigne became Stanford University’s 11th president on September 1, 2016. He returned to Stanford after serving as President of The Rockefeller University, a graduate biomedical research university in New York City. From 2001 to 2005, he was a professor of Biological Sciences at Stanford, where he held the Susan B. Ford Professorship in the Humanities and Sciences. He has also held faculty positions at the University of California, San Francisco, and executive positions at biotechnology company Genentech. This annual lecture honours Dr. Bernice Grafstein. Dr. Grafstein received her B.A. in physiology at the University of Toronto and her Ph.D. in neurophysiology at McGill University in Montreal. Amongst her notable work in neuroscience, Dr. Grafstein is widely-known for being the first woman to become President of the Society of Neuroscience and is currently a Trustee and Vice-President of the Grass Foundation, which supports training and research in neuroscience. She is Professor of Physiology & Biophysics and the Vincent & Brooke Astor Distinguished Professor in Neuroscience at Weill Cornell Medicine in New York City.